The 2017 Nationals season ended the same way that it had in four of the previous six years. Washington cruised to a division title only to get eliminated in the division series. However, 2017 felt different. In game 3, the bullpen coughed up a lead and the Nats lost by a run. Game 5 was truly gut wrenching. Despite being up 4-1, Washington lost. The Cubs ended up winning 9-8 and there was a lot of blame to go around the home team clubhouse. Manager Dusty Baker wasted a challenge in the first and left Scherzer in too long. The Cubs scored runs on a wild pitch, a missed third strike and a hit by pitch with the bases loaded. Lobaton was picked off to end an eighth inning rally and Harper couldn’t deliver in the clutch. Before the World Series even began, the front office had decided to dump Dusty Baker. In his two seasons, Baker led Washington to division titles, winning 95 and 97 games. In both seasons, his team had dominated the NL East. In 2017, Washington went into first place on April 18th and never looked back. Never the less, owner Ted Lerner decided that Baker had to take the fall. Were the 2018 Nationals doomed the moment Baker was fired? The Baker firing was a catastrophic error. The Nationals got greedy. They erroneously decided that any manager can win the NL East and they needed someone who could win in October. Washington forgot that running away with the division should never be taken for granted. After starting the season 4-0, it looked like rookie manager Dave Martinez had what it takes. Unfortunately, reality hit. The took a 7-16 nosedive and things started to look really bad. In May, the team rebounded and went 20-7. In early June, the team was still in first, but eventually things started to fall apart. After a loss on June 10th, the Nats began a 32-46 slump. While they were able to get enough together to end just above .500, the season was a disaster. What made 2018 so painful was that everyone thought Washington would dominate. CBS Sports, Fan Graphs, ESPN, Bleacher Report, SB Nation, Baseball America and others all assumed in March that it was a forgone conclusion that Washington would have a cake walk. So, what went wrong? The rookie skipper struggled in his first season. Whenever a team has a drop off, one is inclined to see if injuries were to blame. In 2018, Washington had injuries, but they didn’t ruin the team. Zimmerman was limited in his playing time, but Adams was excellent in his place. Wieters missed a couple months with a hamstring injury but if anything, they played better without him. Strasburg had some trips to the DL but was having arguably the worst year of his career. The only major injury that they had was to Daniel Murphy. With that said, at age 33 something like this could be expected. While many answers can be given, there is one that strikes me as the main culprit. The Nationals became complacent. Prior to the season, Washington made a grand total of zero trades. They were also quiet on the free agent front. While they brought back Brandon Kintzler and Howie Kendrick, the only other moves of note were signing Matt Adams and Jeremy Hellickson. Adams did a good job when Zimmerman was injured. Hellickson was a solid middle of the rotation guy. Still, the assumption that everyone who played well in 2017 would continue to do so, turned out to be a mistake. Successful teams have depth. If you look at the OPS of their key players from 2017, the only one not to have a drop was Matt Wieters. Considering that he had a terrible offensive season in 2017, it isn’t saying much. See the comparison below. The same could be said of the starters. While Scherzer was excellent again, and Roark improved, Strasburg and Gonzalez were hit hard. Compare their ERA’s over the past two years. As the Nats fumbled through July, only one question remained. 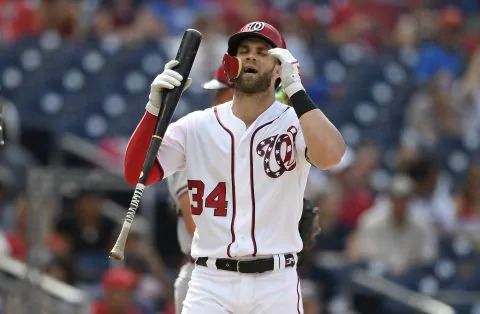 Would Bryce Harper be traded? The superstar was heading to free agency and the Nats were not winning with him. With no shortage of teams competing, it looked like the best thing would be to trade him and raid a team’s farm system. They chose not to do this. Instead the Nats will give Harper a qualifying offer that he will most certainly turn down. This will net a compensation draft pick. However, this is not a smart strategy. Under the most recent Collective Bargaining Agreement, the Nationals will likely end up with a compensation pick after the second round. In other words, it will only yield an extra pick around slot 74-79. With the likelihood of Harper remaining in DC very small, not trading him seems like a blown opportunity. The Nationals were arguably the biggest bust in 2018. To make matters worse, many key players from years passed were either traded or are heading to free agency. Kintzler and Murphy were sent to the Cubs and Shawn Kelley to Oakland. Gio and Madson were traded right before the August deadline. Besides Harper the Nationals have several other notable free agents. Wieters, Holland, Herrera and Hellickson are all free agents. In terms of committed money, the Nationals currently owe over $110 million to just four players. That doesn’t include Rendon, who is about to get a pay raise after earning $12.3 million in 2018. If Washington wants to keep Roark, they will likely have to pay him close to $10 million. This means that unless the Nats decide to break the bank, it is hard to see them making a big splash in the free agent market. In 2019, the Nationals will need a big season out of Soto. If Washington wins in 2019, they will need Juan Soto to continue his excellent play. Perhaps, he can replace Harper’s production. Turner and Difo will need to reach their potential and Taylor must return to 2017 form. Most importantly, the Nationals need pitching depth. Scherzer is a hall of fame, but they have too many question marks after him. This could be the start of a dry spell.